Our construction project is moving along according to schedule. Actually, since we built a huge wall to isolate the construction site from the house, the impact on our daily life and privacy is minimal. The most difficult part is trying to keep the dog from invading the work area every time we have to slide open the gate to get to the garage. I'm of course taking a bunch of pictures... documenting every step of the construction process. I've decided to keep an online chronicle of the progress through pictures, in an album which I have created in the gallery. I know that it probably won't be of much interest to most, but, it's easy enough to do, so why not? I'll be posting the pictures either daily or every few days, depending on the progress or time available. The photo-chronicle can be seen here (Under Construction). I've snapped the pictures from more-or-less the same perspective so if you step through them, you can clearly see the changes each day (I wish I had thought about being more consistent with the POV so I could actually splice together an animation of the construction progress later!). 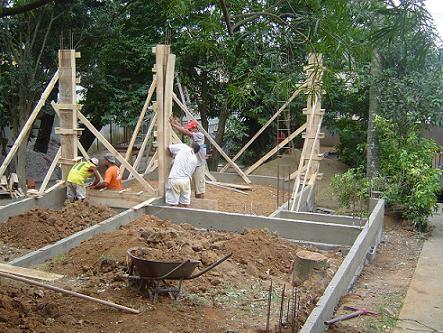 It may seem like it's going slow, but you must realize that this type of construction, which is very typical in Brazil, is extremely labor intensive: the concrete is hand mixed on a pallet (no mixer), and all digging is done with picks and shovels (no backhoe). All things considered, it's moving along at a brisk pace. If you want to see a floorplan of the construction (which will house my office, a living room / guest room, bathroom, tiny kitchen and a veranda), click here. A profile view and full plan of the entire yard with our current house can be seen here. The larger view shows an outdated floorplan, however; before we had decided to build a mini-kitchen onto the living room. I'm tired and haven't been in much of a blogging mood-- nor have I had much time for blogging. But I was navigating around the internet when I finally ran into this webpage, much to my relief. The internet is growing at such a rapid rate that I thought I could never keep up with it; so this was really good news! Now I can sign off and get to bed! Really ... click it! It's worth it! And, pardon my prying, but are you going to do something decorative with that stump in the foreground of the picture in this post? Just odd to see a tree stump inside a building foundation. Well, my older son wanted me to leave the *whole tree* inside the house ... I think I mentioned that in an earlier blog post. Actually, the stump would make a curious end table ... an interesting conversation piece. But nah, the picture was taken before the guy with a chainsaw came back to finish digging it out! It's gone now!